This lecture will engage in a particular methodological exercise: to discuss the changes in the economy of north-central Italy in the eleventh and twelfth centuries using nothing except the evidence available from archaeology and the study of standing buildings, that is to say without discussing written documents. 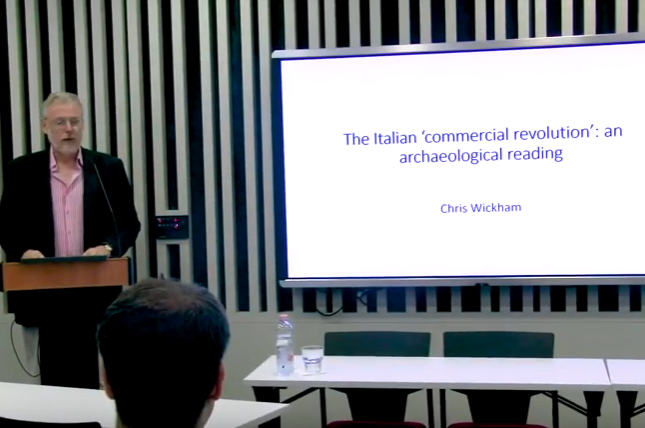 Archaeology tells us more about how commerce really worked than written texts do, but it has not been used enough to construct historical narratives on its own; this lecture will offer one. One of the results is that the ‘commercial revolution’ can be seen to have begun later, and for different reasons, than traditional narratives suppose. Chris Wickham has recently retired for the post of Chichele Professor of Medieval History at the University of Oxford. Prior to that he taught at Birmingham. He has written books on medieval Italy up to 1250, on its social, economic and legal history; he has also worked on social memory and, extensively, on the comparative history of Europe and the Mediterranean. He is currently working on a general history of Mediterranean commerce during a long eleventh century.